'Gay Jewel' (Midred Brizendine, R. 1964). Seedling #MB-10-61. MDB, height 8" (20 cm). Early bloom. Standards yellow; falls dark brown; lavender-blue beards. 'Zing' sibling X Cook seedling #1546. Brizendine and Old Brook 1965. 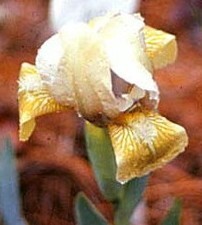 Honorable Mention 1966; Judge's Choice 1967; ASM 1972.